What a very cool photograph! I could never image being where these guys are, but, what a fantastic view it must be! This photograph taken in the 1930's by Charles Ebbets is just classic. Charles Clyde Ebbets (August 18, 1905 – July 14, 1978) was an American photographer who is credited with having taken the iconic photograph Lunch atop a Skyscraper . Ebbets was born in August 18, 1905 in Gadsden, Alabama. He bought his first camera at age eight by charging it to his mother's account at a local drugstore. By the 1930s Ebbets was a well-known photographer and had work published in major newspapers across the nation, including the New York Times. 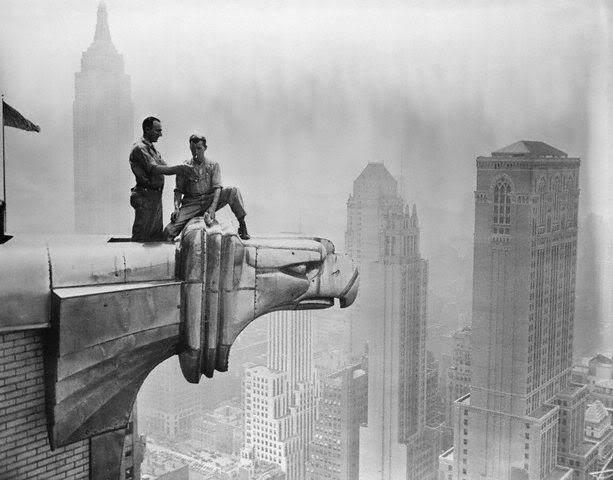 In 1932, Ebbets was appointed the Photographic Director for the Rockefeller Center's development. On September 29, 1932, he took the photo Lunch atop a Skyscraper, which depicts eleven men sitting on a girder eating lunch, their feet dangling from the beams hundreds of feet above the New York streets. The photo was taken on the 69th floor of the RCA Building in the last several months of construction. It has been postulated that multiple photographers collaborated on the shoot, however, the Ebbets family has produced verified written records of Ebbets' authorship including original receipts on Ebbets' professional letterhead showing his billing for the work done on the shoot, an original glass negative of Ebbets at work that day on the beam adjacent to the workmen, other original images taken by Ebbets during his work at Rockefeller Center, photos of the image displayed in Ebbets' office at Rockefeller Center, as well as copies of the original article from 1932 showing the famous photo which were found in his personal scrapbook. All of these documents supporting Ebbets' authorship have been independently verified by professional researchers, intellectual property attorneys and private investigators. During the photo's worldwide circulation over the past 20 years, no other photographer nor any photographer's estate has ever claimed authorship of the famous image. We should be very happy that we have the wonderful images Mr. Ebbets produced to enjoy in 2017 and for many years to come!